How to master your next DreamWalls® paint project. Maybe it's been a while since you've painted, or maybe you've never done it before. Even if you feel like you barely know which end of the brush to hold, that's OK — DreamWalls® paint has you covered with simple instructions for common projects and helpful answers to FAQs. Follow the advice below to keep your next painting project moving along smoothly. Move furniture out of room or cover it with a drop cloth. Remove wall hangings, switch plates, ceiling fixtures (if possible), window latches, doorknobs, etc. Use masking tape and plastic sheets to cover objects and surfaces that will not be painted and cannot be moved. Cover the floor with drop cloths. Wash the walls from the bottom up to prevent streaking. Rinse with water and a sponge. Use drywall compound to fill holes and smooth out rough areas in walls. Once the compound is dry, lightly sand it with fine-grit sandpaper (150 to 200 grit). Vacuum up the dust after sanding. Paint top to bottom. Start with the ceiling, then the walls and woodwork. Paint the ceiling edges with a brush, creating a border about 2" to 3" wide. The easiest way to paint a ceiling is with a roller and extension handle. This allows you to stand on the floor while you paint. Dip your roller in the paint tray and roll it back and forth on the ridged part of the tray. Use diagonal or zigzag strokes to get the paint on the surface. Go back over the area with longer, up and down strokes to even out the surface. When the ceiling is dry, start painting the walls. Use a brush to paint corners, ceiling edges and areas adjacent to woodwork. Use roller to paint in blocks of roughly 4 x 4 feet. Paint adjacent blocks before each previous block dries to help blend the edges. Paint molding and woodwork with a brush. 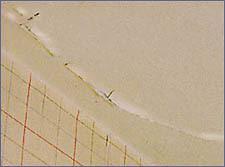 Use wide masking tape to mask off adjacent areas (e.g., window panes). Paint with the grain of the wood. Use short strokes to coat the surface with paint, then use longer, smoother strokes for an even, finished surface. 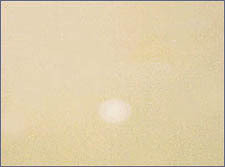 Blistering — Bubbles under the painted surface caused by exposure to moisture shortly before the paint has completely dried. Investigate the source of the problem before preparation to ensure it won't spread. Scrape away all loose or flaking paint, and then sand smooth. Seal the surface with a high-quality primer. In high-traffic areas, use premium latex exterior paint/interior paint. Burnishing — Increase in gloss or sheen of paint film when subjected to rubbing, scrubbing or having an object brush up against it. Paint heavy-wear areas that require regular cleaning (e.g., doors, window sills and trim) with a top-quality latex paint, interior or exterior, because this type of paint offers both durability and easier cleaning capability. In high-traffic areas, choose a semigloss or gloss interior paint colors rather than a flat sheen level. Clean painted surfaces with a soft cloth or sponge and non-abrasive cleansers; rinse with clean water. 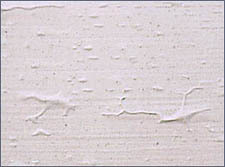 Cracking/Flaking — Flecks of paint flaking from a surface. Scrape away all loose or flaking paint, then sand it smooth. Seal the surface with a high-quality primer. In high-traffic areas, use premium latex exterior paint/interior paint. 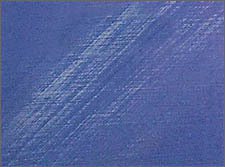 Lapping — Appearance of a denser color or increased gloss where wet and dry layers overlap during paint application. Using a top-quality latex paint makes it easier to avoid lapping problems because higher solids (pigments and binder) content makes lapped areas less noticeable. If substrate is very porous, it may need a primer/sealer to prevent paint from drying too quickly and reducing wet edge time. Alkyd interior paint colors generally have superior wet edge properties. 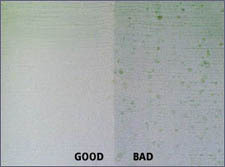 Mildew — Brown, black or gray spots on paint surface (usually found in corners). Scrub the surface with a solution of one part household bleach to three parts water, then rinse. Try to reduce the amount of moisture. In bathrooms, install an exhaust fan, and in basements use a dehumidifier. In high-traffic areas, use premium latex exterior paint/interior paint. 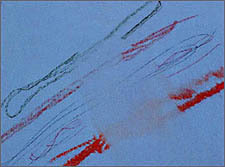 Poor Hiding — Failure of dried paint to obscure or hide the surface to which it is applied. If the substrate is significantly darker or is a patterned wallpaper, it should be primed before applying a top coat. Use a top-quality paint for better hiding and flow. In high-traffic areas, use premium latex exterior paint/interior paint. Use quality tools; use the recommended roller nap, if rolling. 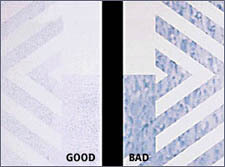 Follow manufacturer's recommendation on spread rate; if using tinted paint, use the correct tinting base. Where a low-hiding organic color must be used, apply a primer first. 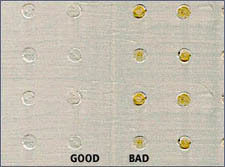 Poor Stain Resistance — Failure of the paint to resist absorption of dirt and stains. Use a higher-quality latex exterior paint/interior paint containing more binder, which helps prevent stains from penetrating the painted surface, allowing for easy removal. Priming new surfaces provides maximum film thickness of a premium top coat, providing very good stain removability and vibrant interior paint colors. Roller Marks/Stipple — Unintentional textured pattern left in the paint by the roller. Use the proper roller cover; avoid too long a nap for the paint and the substrate. Use quality roller to ensure adequate film thickness and uniformity. High-quality paints tend to roll on more evenly due to their higher solids content and leveling properties. Pre-dampen roller covers used with latex paint; shake out excess water. Don't let paint build up at roller ends. Begin rolling at a corner near the ceiling and work down the wall in three-foot square sections. Spread the paint in a zigzag "M" or "W" pattern, beginning with an upward stroke to minimize spatter; then, without lifting the roller from the surface, fill in the zigzag pattern with even, parallel strokes. 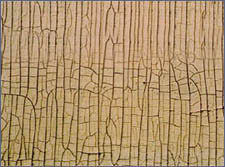 Wrinkling — Buckling paint caused by painting a warm, sunlit or wet surface. Scrape away all loose or flaking paint. Dull the surface with a fine grit sandpaper. Seal the surface with a high-quality primer. In high-traffic areas, use premium latex exterior paint/interior paint. Yellowing — Development of a yellow cast in aging paint; most noticeable in the dried films of white paints or clear varnishes. Top-quality latex paints do not tend to yellow, nor does non-yellowing varnish. 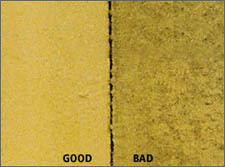 Alkyd paints, because of their curing mechanism, do tend to yellow, particularly in areas that are protected from sunlight. In high-traffic areas, use premium latex exterior paint/interior paint. Here are five simple ideas to add color to your home in a single day's work. Just click on each project idea below for easy-to-follow how-to tips. There's nothing like a good first impression. The first step to a good first impression? Give the door a quick wash and rinse, letting it dry completely. Next, just cover the metal hinges so they don't get covered in paint - a couple coats of rubber cement should do the trick. Mask the doorknob, lock and any other hardware as well. Now you're at the fun part. Start by painting the frame, making sure to work up from the inside bottom, across the top and then down the other side. This is done best with a 2" to 2.5" brush. When you start on the door, use a 4" brush or foam roller. Add a little color to your greenery. If you're painting a planter that's already been used, start by giving the plant a new home and scrubbing the planter with warm, soapy water. Give it a quick rinse and let it dry completely before applying any paint. This is a good time for lemonade. Try it with a little mint for a refreshing twist. Apply the first coat, inside and out. Follow that up with a couple more coats for denser color, allowing enough time to dry between coats. Looking for a little color inspiration? Why not run with the whole refreshing beverage theme and try Sweet Tea? Even your black lab will be green with envy. Start by treating the wood with a coat of primer. It's a great way to protect and seal the wood and ensure durability. Using a paintbrush, apply one coat of paint to each side of the house. Once that dries, just brush on a second coat for denser color. Remember, dogs are color-blind, so the choice is entirely up to you, but they'll probably like anything named after food. Oh, and to keep this simple project from getting a little complicated, you may want to keep your dog indoors until the paint's dry. Your view just got even better. Start by removing any soil or debris left in the box and rinsing it with soap and water. As always, don't forget to let it dry completely before you move to the next step. Before you paint, spray the entire box with one coat of white enamel. Once that's dry, it's time to pick up a paintbrush. Paint the box with the color of your choice. You can even match the paint color to the flowers you plan on planting. Consider it the perfect frame for your masterpiece. Start by rinsing the fence with a hose. It's important to remember to unhook the sprinkler if it's still attached. Once it's dry, dip a 4" to 6" brush about a third of the way into your paint. Follow the grain of the wood, painting each slat in an up-and-down motion. Add a second coat using the same up-and-down strokes you did the first time. Simple as pie. As for color, try a twist on a classic, like Granny Smith White. Pressure-wash or clean the surface well. Then, sand and scrape away all loose or flaking paint. Finally, apply a high-quality latex home paint. Blistering — Bubbles under the painted surface. Pressure-wash or clean the surface well. Sand and scrape away all loose or flaking paint. Then, caulk all cracks and gaps around windows. Finally, apply a high quality latex home paint. Chalking — A fine powder on the paint's surface associated with old or poor-quality paints. Pressure-wash or clean the surface well. After washing, run your hand over the surface to check for additional chalking. If it still exists, you'll need to prime the surface. Finally, apply a high-quality latex home paint. 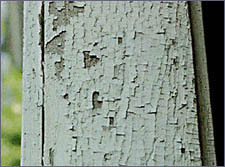 Chipping/Flaking — Specks of flaking paint caused by spreading the paint too thinly during application. Dirt pickup — Accumulation of dirt on siding caused by the natural aging of home paint or the use of a low-quality paint. 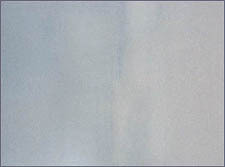 Fading — Occurs when paint color fades because of age or sun exposure. Mildew — Black, brown or gray spots on the painted surface. Trim away plants that may be contributing to the mildew. Scrub the surface with a solution of one part household bleach to three parts water, and then rinse with clean water. If needed, retouch or repaint with a high-quality latex home paint. 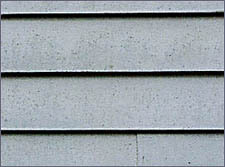 Nailhead Rusting — Rust spots on home paint surface caused by using non-galvanized nails. Sand to remove rust, then countersink the nailheads and fill uneven areas with putty. Finally, retouch or repaint with high-quality latex home paint. Paint incompatibility — Layers of peeling paint on top of old paint caused by using a latex paint over old oil paint that is not properly prepared. If you are painting over an oil-based paint that has not been on the surface for at least one year, always sand the surface. If needed, retouch or repaint with a high-quality latex home paint. Peeling — Large sections of home paint peeling away from the surface, usually caused when moisture seeps through the exterior walls from inside the house. Pressure-wash or clean the surface well. Sand and scrape away all loose or flaking paint. Then, caulk all cracks and gaps around windows. Finally, apply a high-quality latex home paint. 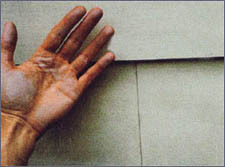 Poor Alkali Resistance — Color loss on fresh masonry caused by applying paint to masonry that has not cured for a full year. Allow masonry to cure for a full year before painting, or apply an alkali-resistant primer. Finally apply a high-quality, 100% latex home paint. 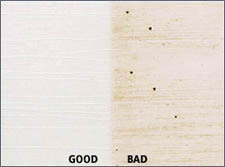 Tanning Stains — Brown/tan discoloration that typically occurs on woods such as redwood, cedar and mahogany. Wrinkling — Buckling paint caused by painting a warm, sunlit or wet surface; applying home paint too thickly; or painting over a dirty surface. Pressure-wash or clean the surface well. Then, sand and scrape away all loose or flaking paint. Finally, apply a high-quality, 100% latex home paint. Due to the high levels of humidity and condensation that both kitchens and bathrooms are subjected to, they become prone to paint cracking, peeling and mildew. In order to avoid these problems, a semi-gloss paint is recommended. A semi-gloss paint has a higher sheen value, meaning it provides a harder finish that proves more moisture resistant. Along with this, a semi-gloss finish is also very washable and scrubbable. The majority of alkyd/oil paints when applied at room temperature will be dry set-to-touch within six to eight hours and may be recoated within 16 hours. Poor ventilation, low temperatures, thick films and high humidity will increase these times. Mildew is an exterior surface problem and is areas of black, gray or brown spots formed on paint and other surfaces, particularly in damp, shady areas. Mildew is caused by warm, humid conditions, poor air circulation and little direct sunlight, like under eaves or overhangs. Shrubbery planted too close to a building is an ideal place for mildew to grow. Mildew must be removed before painting or it will come through the new paint. Remove all mildew by scrubbing with a solution of household bleach and water. Mix 1 part bleach to 3 parts water, and remember to rinse the surface thoroughly with a garden hose after washing. (Power washing is recommended for larger areas.) Always wear appropriate safety equipment (rubber gloves and eye protection) when using this solution, and protect your shrubbery and plants with plastic sheeting. 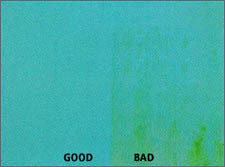 After getting rid of all mildew, priming is essential for better adhesion, sheen uniformity, mildew control and durability. Select a top quality exterior paint in the color and sheen of your choice. As long as the paint is not clumpy or doesn't have a foul odor, it is usable. Ventilation! Ventilate well, any rooms being painted. Warm air movement is the most effective paint-curing mechanism. Remove any drapes and furniture, if possible, before painting. Paint fumes, even from latex paints, can permeate drapes, carpet and furniture. Cover furniture if it can't be removed. Before painting make sure that the shutters are dirt free. Apply a single coat of "Gripper." Follow with a 100% acrylic latex, satin or semi-gloss paint, in your choice of color. One to two coats will be required. Base that decision on how well a single coat covers the primer. When beginning your paint project, you'll want to consider the sheen of the paint — or the gloss level. The higher the gloss level, the shinier the appearance and the more scrubbable the finish. There are different types of sheens for different areas of your home. Flat sheens are ideal for low-traffic areas such as formal dining rooms and master bedrooms. They provide a beautiful matte coating that hides minor surface imperfections. Ideal for living rooms, dining rooms and bedrooms. 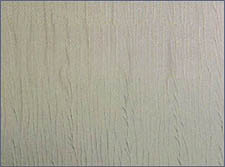 Eggshell paints provide excellent coverage that is washable and scrubbable. They have a slightly lower sheen than satin but offer the same type of durability. Eggshell paints are ideal for living rooms, bedrooms and family rooms. Satin paints go a step above flats in scrubbability, providing a nice balance between washability and subtle gloss. They perform and look great in just about any room. Semi-gloss paints ensure maximum durability. They are commonly used in children's rooms and high-moisture areas, such as bathrooms, as well as for trim. High-gloss paints are highly reflective and work well for highlighting details, such as trim and decorative molding. They are also the best choice for doors and cabinets — or any area that sees a high volume of abuse. Ceiling flats are designed specifically for ceilings. These are usually extra spatter-resistant. If you have any leftover paint, thinner or other chemicals, they should never be poured down the drain or otherwise disposed of carelessly. Leftover paint in usable condition can be donated to churches, schools or other organizations. To determine if old paint is still usable, stir it with a paint stick and if the paint is smooth, it is still good! Empty cans or those with a small amount of water-based paint in them should be left open and allowed to dry in a ventilated area, out of the reach of children and pets. In most states, cans with dried latex paint may be discarded with household trash. Oil-based or alkyd paints should be allowed to dry by adding absorbent material such as kitty litter. Leftover paint can become dangerous if not disposed of correctly. Become familiar with the disposal procedures recommended in your municipality. Some make regular, scheduled pickups of household hazardous waste; some have recycling programs. Oil-based paints offer superior one-coat hiding and better adhesion to difficult surfaces (such as those not thoroughly cleaned). 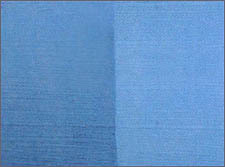 Oil-based paints allow for greater open-time (or length of time the paint may be brushed before it sets), superior resistance to "blocking" (or face-to-face sticking) and resistance to abrasion, once cured. Remove loose, flaking, chalky or blistered paint with a paint scraper, putty knife and wire brush. Loose paint can also be removed with a power washer. 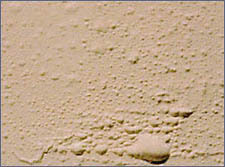 Sand the edges of the areas where paint has been removed to create a smooth surface. 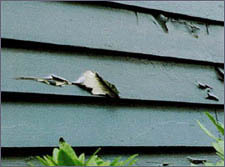 Fill gouges or holes in wood siding with an exterior-grade patching compound. If damage is more extensive, replace the damaged piece(s) altogether. Seal cracks, seams and gaps with paintable exterior caulk. Clean the outside of the house from top to bottom. If you use soap, rinse the siding well. Allow the surface to dry. Mask off areas that are not to be painted. You can put newspaper or plastic drop cloths over things like windows, doors, sidewalks and driveways to protect them from drips. Paint in the following order overall: 1) gables, 2) main siding, 3) windows, 4) siding trim, 5) doors. When the siding is dry, paint the windows, siding trim and doors. For latex paint, use soap and water. 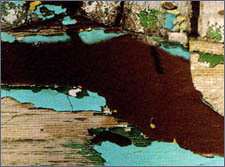 Oil-based paint requires turpentine or paint�thinner. Be sure to clean brushes thoroughly at the end of each day. Are there any tricks to painting windows, doors and trim? Generally, use more delicate strokes with less paint on the brush when painting any kind of trim or details. Below are some more tips for each specific area. Mask off the glass panes. Use a small trim brush to paint the dividers from top to bottom. Paint the window surround areas next. Then use an angled trim brush to paint the face trim around the window. Paint trim from the top down. Use the largest brush that fits the trim you're painting. Take care that paint doesn't "glob" or drip as you work in crevices and joints. If the door has raised inset panels, paint those first. Then paint the door surface surrounding the panels. Dreamwalls Paints is committed towards manufacturing, marketing and distributing paint and water-proofing products since 2004. All content Copyright © 2004 - 2014 DreamWalls Paints Developed By iCore eSolutions Pvt. Ltd.